Born Roger Middleton in Sheffield, in 1939, Maurice Colbourne trained as an actor at the Central School of Speech and Drama and spent time in repertory theatre. His first major television role was in Gangsters in 1976. He also appeared in the popular The Onedin Line at the end of the 1970s. Notable roles continued into the 1980s when he was cast in a strong supporting role as Jack Coker in the popular 1981 adaptation of John Wyndham's science-fiction classic The Day of the Triffids. 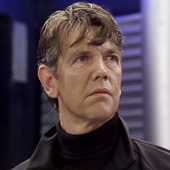 He then played the part of Lytton in the 1984 Fifth Doctor story "Resurrection of the Daleks". His character was judged successful enough to warrant a reprise the following year in the Sixth Doctor story "Attack of the Cybermen". Also in 1985 Maurice Colbourne appeared as an SS Officer in Hitler's S.S.: Portrait in Evil. But it was his role as Tom Howard, in the 1985 soap opera Howards' Way, that he is famous for. Maurice Colbourne starred in five series but suddenly and prematurely died in 1989 in Brittany, France while the series was still in production. Lytton is a distinctive figure among the people that The Doctor had encountered in his travels in that, while The Doctor first encountered him working for his enemies - demonstrating such ruthlessness that The Doctor believed he would shoot his own mother to confirm that his trigger was working - he went on to become an ally during their second encounter, even if The Doctor only realised his true allegiance towards the conclusion of their reunion. Initially appearing as a mercenary working for the Daleks - although he later implied that he didn't join them willingly -, Lytton was able to successfully take control of a prison station where Davros was being kept where the Daleks' attempt at a direct assault had failed by using gas weapons to launch the initial attack, the gas destroying the flesh of the station's occupants before they could react and fight back. With Davros saved when Lytton killed the officers who had been assigned to execute him in the event of a jailbreak, Lytton was ordered to remain with Davros, who was shocked to learn that the Daleks' war with the Movelleans ("Destiny of the Daleks") had reached a point where the Daleks needed human assistance. Lytton subsequently assisted the Daleks in capturing the Fifth Doctor ("Resurrection of the Daleks") when the Fifth Doctor discovered a time corridor between the Dalek ship and Earth in the 1980s, part of the Daleks' plan to replace humans with Dalek duplicates who could serve as inside agents. However, when Davros tried to subvert the Daleks and take control of their plan for himself, followed by the Daleks trying to kill Lytton in the belief that he was too arrogant, the resulting three-way conflict leaving Lytton the only survivor after The Doctor released a Movellean virus against the Dalek forces while the Daleks eliminated the Doctor's current allies. Having escaped into contemporary London, Lytton managed to evade legal prosecution as police could find no record of his birth or education due to his alien origins. Despite his alliance with the Daleks at this time, when The Doctor met Lytton again, Lytton appeared to be working for the Cybermen after he detected their equipment while he was trapped on Earth. Although he was initially shown assisting in the robbery of a diamond merchant just to deliver his accomplices to a Cyber-invasion force hiding in the sewers, claiming that he wanted to work with them, one of Lytton's gang (Really an undercover police officer investigating Lytton's anomalous background) escaped conversion to make contact with the Sixth Doctor and Peri, who had just arrived in London ("Attack of the Cybermen"). Although The Doctor learned about Lytton's new apparent alliance, he wasn't in time to stop the Cybermen discovering the TARDIS and attempting to steal it for themselves, forcing him to take them back to Telos ("The Tomb of the Cybermen") and the rebuilt Cyber-Controller. However, The Doctor realised that Lytton was up to something when he provided The Doctor with the means to sabotage the TARDIS's navigation systems so that he wouldn't materialise in Cyber-Control, Lytton also revealing that the Cybermen had only acquired time-travel after stealing a time machine that had landed on Telos rather than developing it themselves. As The Doctor explored, he learned that Lytton was actually in alliance with the Cryons, who had detected his distress signal and requested his aid in disabling the Cybermens' time machine, which the Cybermen intended to use to save Mondas from destruction in 1986 ("The Tenth Planet") by diverting Hayley's Comet to strike Earth in 1985; although the Cryons knew that this would mean that they would still be conquered by the Cybermen when they might be spared this attack if Mondas survived, they had accepted their fate and refused to sacrifice Earth for their sake (As well as the fact that the Cybermen intended to destroy Telos when they left it to test their new explosives), but needed Lytton's help as they couldn't operate in anything higher than sub-zero temperatures. Although The Doctor was able to destroy the Cybermen tombs by heating the Cybermens' samples of vastial, a mineral that exploded at fifteen degrees above zero, Lytton was captured and interrogated by the Cybermen, even being partly processed for conversion into a Cyberman, when he tried to steal the time machine. The Doctor tried to save him, but the Cyber-Controller attacked the conversion chambers when The Doctor arrived, with Lytton sacrificing himself to help The Doctor destroy the Cyber-Controller by stabbing him with a knife as the Controller broke Lytton's neck. The Controller's injury distracted it long enough for The Doctor to grab a discarded Cyberman gun and shoot the Controller, departing as the vastial exploded and the Cybermen forces on Telos were destroyed. Although The Doctor had saved history and defeated the Cybermen, he was left reflecting that he felt like this adventure had been a personal failure despite this success, grimly noting to Peri that he felt like he had never misjudged anyone as badly as he had Lytton.